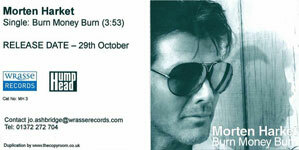 The third UK single from Morten's "Out Of My Hands" is the promo only release of "Burn Money Burn". This is a 1-track promo featuring the album version (3:53) of the track. The CD comes with a folded paper insert in a pvc sleeve. The front of the insert features a black and white close-up shot of Morten's face, looking to the right and wearing sunglasses. To the right of Morten's face is the title, printed in white at the bottom. The back of the insert is white with the titles and release date in black at the top. The Wrasse Record logo is printed in blue and white in the middle with a black and white Hump Head logo. Wrasse Records contact details are below in black. The disc is white with the titles in black at the top, release date and contact details below. 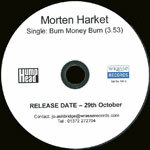 The Hump Head and Wrasse Records logos are printed either side of the centre of the disc.